The most significant difference between the two transmissions is that in manual transmission the driver uses a clutch to change the gears whereas a car with an automatic transmission adjusts the gears automatically based on the engine speed. Global Automotive Transmission provide the specialized services to all Automatic & Manual transmission vehicles. We provide transmission repairs service in Camden, Penrith, Parramatta, Sutherland, Castle Hill, Liverpool, Blacktown and across all suburbs of Sydney. Global Automotive Transmission are provide the specialise services to all Automatic & Manual transmission vehicles. We have over 20 years of experience in transmissions and are committed to meeting our customer needs & requirements. With in-depth mechanical knowledge for over 20 years in the business, we can handle all your transmission services quickly & efficiently. Our goal is to ensure complete satisfaction of every customer, while offering friendly & knowledgeable service at fair & honest price. If you require quality and prompt service and save cost at the same time then Global is the answer. Repairs both Automatic & Manual Transmissions for all models & doing so for over 20 years. Qualified technicians and state of the art tools & equipment. Two workshops Liverpool and Blacktown. Oil leaks from auto/cooler pipes. Motor not operating to its standard. Over heating that can destroy gear box. We are the leaders & specialists in this industry with highly trained & experienced technicians. Our trained staff can easily diagnose any kind of electrical problems linked to gear shifting or abnormal gear movements & can efficiently repair the problematic part. Our Mission is to provide the best transmission and automotive services at affordable prices all over Sydney. Stay up-to-date on our service offerings including: Auto Repair, Transmission Repair and are committed to meeting our customer needs and requirements! We “Global Automotive Transmission” provide all automatic and manual transmission repair service across various suburbs of Sydney. We have successfully served our service to the various suburbs like Camden, Liverpool, Penrith, Blacktown, Parramatta, Sutherland and Castle Hill. Engines and transmissions are mechanical systems typically found in bigger machines. Each has its own uses and functions which this article aims to enumerate and explain. An engine, also referred to as a motor, is a machine that is designed to transform one form of energy into mechanical energy. A heat engine burns fuel to be able to produce heat, which in turn, turned into force. Motors powered by electricity use electrical energy to produce mechanical motion. Myosins (i.e. molecular motors) found in muscles produce force to enable motion through the help of chemical energy. An engine can be categorized using two criteria: the form of energy it can use to produce motion and the kind of motion it produces. These are heat engines, electric motors, physically powered motors, and hydraulic motors. Heat engines use heat energy and chemical energy to produce mechanical energy. Common examples of heat engines are found in cars, rockets, nuclear submarines, and wristwatches. Electric motors (e.g. dynamo, generators) harness electrical energy to produce mechanical energy. These are household appliances, machine tools, and industrial fans to name a few. Physically powered engines run on potential or kinetic energy which includes pneumatic motors, elastic bands, and clockwork motors. A hydraulic motor is another kind of engine that gets its power from pressurized fluid. Hydraulic motors are usually used to produce motion and move heavy loads. 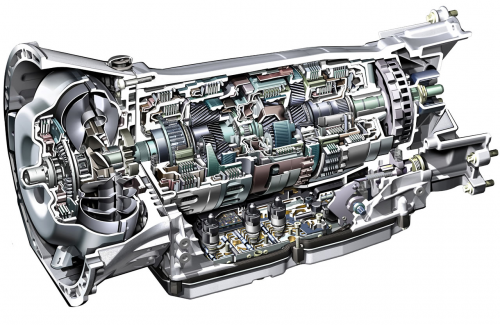 A transmission, usually referred to as a gearbox, is a mechanism found in a power transmission system. In mechanics, a transmission is a machine that controls the application of the power produced by mechanical engines. It utilizes various gears and gear trains to distribute torque and speed conversions coming from a rotating power source to another device. The most common application of transmission systems is in motor vehicles. This is where the transmission adapts the power produced by the internal combustion engine to the drive wheels. The transmission works to reduce higher engine speeds to match the slower wheel speeds. This action results in an increased torque. Pedal bicycles also make use of simpler transmission systems where varying rotational speeds and torques are adapted. A typical transmission system is composed of a number of gears (i.e. gear ratios) with the ability to switch between these gears as speed increases or decreases. Switching gears may be done either manually or automatically. Forward and reverse control may also be incorporated, particularly in most motorized vehicles. In automobiles, the transmission is usually connected to the engine crankshaft through a flywheel or fluid or clutch coupling. Output from the transmission transfers through the driveshaft to the differentials which, in turn, drive the wheels. In addition to gear reduction, a differential’s main function is to allow the wheels at both ends of an axle to spin at varying speeds while it changes the direction of the rotation. So what’s the difference between an engine and a transmission? In mechanics, an engine is a machine specifically designed to transform one kind of energy into mechanical energy. In motor vehicles, a transmission system is a machine that controls the distribution of power generated by its internal combustion engine. 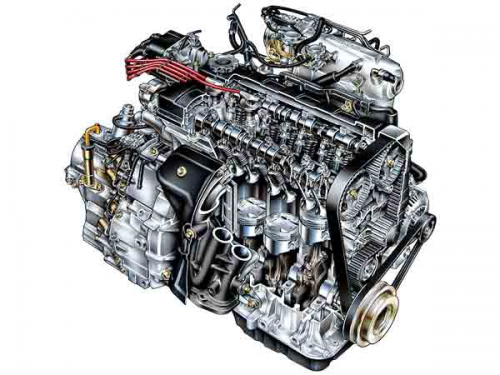 An engine is categorized by the energy it uses and the kind of motion it produces. Heat engines, electric motors, physically powered motors, and hydraulic motors are the different categories in current use. A transmission system is categorized by the process in which gear switching is achieved, either be manual or automatic.